Auditing your brand can reveal gaps in your story and lapses in your marketing. This guide will show you how to audit your agency’s digital brand and improve it. Is your digital brand doing a good job of telling your story? For most agencies, the honest answer would be a clear “no”. Digital branding is one of those perpetually neglected parts of an agency. The agency might do exceptional branding work for its clients, but its own brand is often ignored. But your digital brand is important. Even if you have a full pipeline of leads, you need a strong brand to complete your story. Ignore it and you’ll find that prospects struggle to spot you in a sea of me-too competitors. So in this guide, I’ll show you how to audit and understand your agency’s digital brand. And once audited, how to transform it to be digital-ready. Why Do a Digital Brand Audit? You might have your value proposition and target audience perfectly mapped inside your head, but is it really conveyed in your marketing? This is the fundamental question a digital brand audit seeks to answer. Think of it as stepping out of the fishbowl to see your agency as it really is - and not as how you perceive it to be. Once you know the gap between where you are and where you should be, you can create a brand that is consistent and clear. Far too often, agencies position themselves in a way that neither helps them stand out, nor speaks to their target market. They use generic language and fluff-laden landing pages that don’t tell their story. A digital brand is fragmented. It isn’t just the website or logo; it is the sum of all the crumbs you leave online - guest posts, social media updates, and even website comments. Because of its fragmented nature, it is easy for inconsistencies to creep into your digital brand. Some critical channels might go without updates. Some blog posts might not convey the values you believe in. Before you know it, no one truly understands what you do or what you stand for. A digital brand audit helps you zero-in on the “baseline” defaults for your brand. This can ensure that all your prospects get a consistent brand experience, regardless of what channels they use. How you market yourself often springs from your brand. A brand perceived to be “fun and quirky” will have a different marketing approach than one seen as “sophisticated and traditional”. A digital brand audit can help you spot the strengths and weaknesses of your marketing approach as they relate to your brand. It will tell you if there is poor brand-marketing alignment. It will also tell you if you’re focusing too much on your brand’s weaknesses rather than its strengths. How do prospects currently see your agency? What values do your existing clients associate with your brand? How does it compare to your competitors’ brands? A digital brand audit will help you answer these questions. It will help you take stock of your current standing in the market. It will also enable you to understand how your brand performs in relation to your competitors. Armed with this knowledge, you can bridge the gap between how customers see you and how you see yourself. In the next section, I’ll cover how to do a brand audit in detail. The brand auditing process is an exercise in introspection. Sure, you’ll survey clients and analyze competitors, but it all starts with a deep understanding of your agency and its core values. Let’s look at each of these steps in more detail below. The first step in the brand audit process is to actually take a step back and ask yourself: "does my current brand truly capture the essence of my agency?" Client needs change. Agencies evolve. Employees grow. The brand that you put together a decade ago might not be perfect for your current requirements. Perhaps you started out as a full-service agency, but now focus mostly on app development. Your brand, however, still reflects your old values. What are your agency's current values? Have they changed in any way since the agency's inception? If yes, how? What unmet need did your agency fulfill when it was started? Has this changed over the years? If yes, how? What is your best work? Why? What kind of clients do you serve? Why do they choose your agency over others? What is one thing you do better than anyone else on the market? What is the one value everyone in your agency believes in? Are you communicating this in your marketing? What kind of problems do your people love working on? It’s important to take a step back when answering these questions. You want objectivity and honesty. Back up claims with data where possible. If you say you’re an “app development” agency, show it in your project data as well. You’ll often find that your founding vision isn’t reflected in your reality. You might have started out as one type of agency, but have evolved into another. Your goal, essentially, is to catalog where you used to be, where you are, and where you should be. The better you understand your fundamental values, the better you’ll be able to change your brand to reflect them. The next step is to take stock of your existing brand. How do you represent yourself on different channels? Is your brand clear and consistent across all client touch points? Start by creating a spreadsheet. List every audience interaction online and your existing brand response to it. Are you using channel-specific header graphics for all major social channels (especially Facebook, Twitter, and LinkedIn)? Does each social channel have your latest logo? Do you have branded handles or URLs for your agency on major channels (such as “@AgencyName”)? Is your profile description consistent across every channel? How often do you update each channel? How many followers/likes do you have on each channel? What is your follower to followed-by ratio? Are you using channel-specific messages or cross-posting the same message across all channels? Do your channel-specific messages align with the channel audience’s expectations (short and casual for Twitter, longer and business-like for LinkedIn)? What is your message mix (text, images, videos) for each channel? Are there any emerging social channels that you’ve ignored? Is your logo, slogan, and footer messaging consistent across all your web pages? How often are your blog and company news pages updated? Do you have consistent fonts and colors across all web pages? Are your press mentions, team, and about page up to date? Does your web presence have the same messaging as your off-site and social media? Can visitors access your social profiles and contact page easily from the website? Are you listing your navigation menu links by their priority (i.e. the most important pages - such as ‘services’ - are shown first in the menu)? Do you have a baseline word count for all your blog posts? Are there any blog posts that don’t meet this target? Do you have a consistent design for all your eBook covers, blog post banners, and internal graphics? Do you have a consistent voice for all your content, including on social media, blog, and off-site content (such as guest posts)? Is your high-value content (such as eBooks) clearly marked as such? Can audience access this content easily? Do your client-facing documents (reports, proposals, etc.) carry your branding? Do you have your logo, website, slogan, and social media URLs in all employee email signatures? Do employees have email avatars, Gravatars, and other personal identifiers? If you use a client portal, does it carry your branding? Do you have a consistent brand identity across all agency directories such as Clutch, UpCity, etc.? Are your email templates aligned with your website brand? Do all guest posts and collaborations feature consistent brand messaging? Of course, you should also consider your stationery and business cards, but since we’re looking only at digital brand assets, we’ll ignore them for now. Add everything up in your spreadsheet. After taking stock of your existing brand presence, you can start gathering insight on how to improve it. Do a superficial rebrand where you update all client touchpoints with same brand assets to ensure consistency. Do a deep rebrand where you change positioning, messaging, and even core brand values to fit market needs. Which of these options you choose will depend on the current strength of your brand. Do you have strong brand-market fit? If not, what can you learn from your clients to improve your brand? I’ll show a process to find answers to these questions below. Like product-market fit, brand-market fit is that ideal combination of brand elements that speak directly to your target audience. When you have brand-market fit, your positioning is aligned with your customers and your messaging is clear, cohesive, and concise. How extensive a rebrand you need will depend on whether or not you’ve achieved brand-market fit. This is a two-sided process. You’ll have to evaluate how satisfied you are with your own brand. You’ll also have to survey the market to see if your brand resonates with your audience. An ideal brand-market fit is when your brand speaks to both you and your clients. Start with the introspective exercise first. Revisit the questions you answered in step #1. Ask yourself: am I happy with the current state of my brand? Does it really convey the values the agency believes in? If the answer is ‘no’, figure out what your ideal brand would be like. What would you change - logos, designs, experiences, messaging, etc. - to create this ideal brand? But a brand that speaks only to you isn’t doing its job. You also need to evaluate how the market sees it. Does your brand align with the market? Do clients understand what you do when they land on your website? Is your positioning clearly communicated in your messaging? Answering these questions is a fundamental part of any digital brand auditing exercise. Skip it and you’ll end up with a brand that looks good but doesn’t fulfill its purpose. The right way to do it is to survey the market - both existing and prospective clients. You want to know what your target audience thinks of when it thinks about your brand. How you choose to do these surveys is up to you. You can create an online questionnaire with tools like SurveyMonkey or run a poll with Qualaroo. But your best insights will come from interviewing current and former clients. Interviews let you dig deep into an issue and understand it from the perspective of the client. Positioning: Your positioning defines the space your brand occupies in the minds of your audience. It also defines how you differentiate yourself from your competitors. What do you think of when you think of [Agency]? What niche expertise do you think [Agency] has? Would you classify [Agency] as expensive, affordable, or cheap? Can you differentiate between [Agency] and other competitors? If yes, what are the key differentiating points? How would you describe [Agency] in a single word? What are some unrelated brands that come to your mind when you think of [Agency]? Is it easy to understand what [Agency] does just by looking at its website? Can you figure out [Agency’s] key value proposition in its marketing? Does [Agency] do a good job of justifying its prices? Is it easy to learn more about [Agency’s] history, results, and projects? Is there consistency in [Agency’s] messaging across all channels? Try to see your brand from the perspective of your target clients. Your goal should be to find a middle ground between pleasing your clients and building a brand that you’re happy with. The final step of the brand auditing process is to assimilate and act on your findings. You should end this step with a complete, cohesive brand, and a set of guidelines and templates for future efforts. Start by figuring out whether you need a brand revamp. If your self-analysis and market surveys have shown that your current brand isn’t bringing in results, you might want to change it. This is a long process and beyond the scope of this article. This article by ColumnFive is a good place to start. Once you do have a complete brand, you need to ensure that it is consistent across all channels. Refer to the spreadsheet you created earlier. Look for any gaps in your digital brand presence. Make sure that your brand is represented consistently and clearly on every client touchpoint. The final part of the auditing process is to create a set of guidelines, templates, and defaults. This will help all current and existing employees to present your brand faithfully on every channel. Style guide: Create a style guide that lists your brand colors, logos, and typography. Make these downloadable. Any mention of your brand should be according to this guide. Graphics packet: Create a repository of images and graphics that your employees can use when creating content for your brand. This can be either online or as a downloadable archive. Templates: Create a set of templates for common marketing collateral - eBook covers, blog post banners, emails, etc. - that your employees can use when creating content. Key talking points: Create a shared document with a list of key talking points about your brand (such as “always mention slogan alongside logo in email signature). Mood board: Create a “mood board” with selected images, art, videos, etc. that align with your brand values. Any content you create should spring from this mood board. The digital brand auditing process is long and difficult. When done right, it can bring much- needed clarity and consistency to your brand. A strong brand will help you stand out from competitors, improve your marketing results, and deliver a more delightful client experience. One way to improve your brand consistency is to create a shared document library for the entire agency. 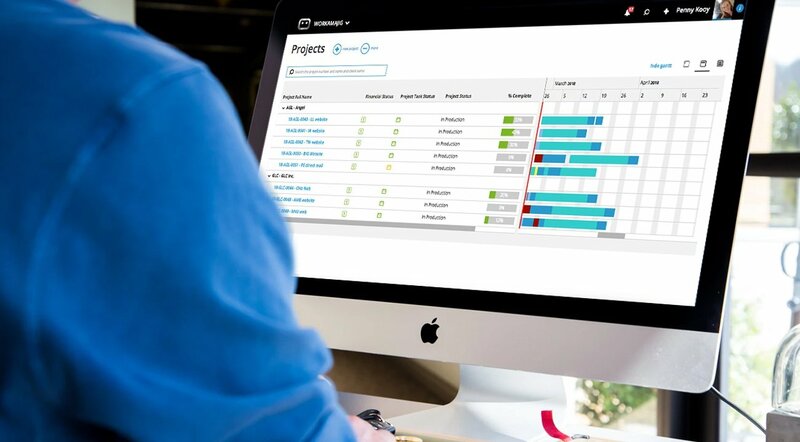 Workamajig’s project management suite will help you do just that, and more.